A dog is known as man’s best friend. However, we often tend to forget that they are animals. When provoked, they can bite us without a second thought. In fact, dogs can bite not only strangers, but also their family members. Human behavior is often the root-cause of a dog bite. Pet owners, especially children, often do something or the other that provokes or frightens a dog. Sometimes, even innocent human behavior can be perceived as a threat by a dog. Other common causes may include protective instincts or injuries and sickness. Certain dog breeds are known to show aggressive behavior. Fortunately, most of these causes are preventable. You can train your dog to learn bite inhibition and public behavior. Here are a few common reasons that can provoke a dog bite. Dogs can be just as possessive as their human friends and often bite when protecting their possessions. Dogs may feel territorial of their property, which may comprise anything such as food, toy, house, car or even a human family member. Though any breed can show this type of aggressive behavior, herding or guarding breeds are most territorial. However, this kind of aggression can be monitored by training your dog from the beginning. The best way to control toy aggression is to teach your dog to obey simple commands such as “leave it,” “let go” or “drop it.” To control food aggression, on the other hand, you may need to take a more strategic approach. Teach your dog to remain calm when you are putting their food down or approaching their food bowl. Make sure to teach your children not to intrude when your dog is eating or playing with a toy. The last thing you want to do is approach a female dog that has whelped recently. Just like any other animal, mother dogs also have strong maternal instincts. So, it is better to stay away from a nursing mother-dog unless you are feeding her. Tell your children not to approach a dog-mother or her puppies without the supervision of an adult. Take proper precautions when handling puppies or feeding a dog-mother yourself. Dogs love to chase moving objects or people such as a cyclist, a jogger or a car. This chasing behavior, also known as prey drive, can sometimes lead to potentially dangerous situations, especially if you have children playing with your dog. Unlike other types of aggressions, prey drive is largely influenced by genetics. Hunting breeds such as Labradors, Pointers and Bloodhounds usually show intense prey drive. The first thing you need to remember is that dogs will never give up chasing behavior. As long as they come across a moving object, they will start chasing it regardless of the circumstances. So, you need to discourage this sort of behavior whenever possible. Ask your children not to play games that involve chasing with your dog. If a dog ever chases you, stop running immediately and face the dog with your arms folded on the chest. If you are knocked over, curl up in a ball to protect your neck and hands. However, avoid eye contact with the dog because it is often perceived as a challenge by the dog and may lead to a bite. If you stand still, chances are, the dog will just sniff and walk away from you. Pain due to an injury or a sickness can put even the friendliest dog on the defensive. Tell your children to stay away from your dog if he/she is suffering from a chronic illness such as arthritis. Teach them to handle injured areas with extreme care. Seek immediate medical help to address the ailment. Diseases such as rabies are a potential health hazard, not to mention the cause of unprovoked attacks on humans. As stray dogs could be suffering from injuries or diseases, tell your children to stay away from them. Dogs can react aggressively in a fearful situation. Mutts showcasing this type of behavior are also known as defensive or aggressive dogs. Fear aggression is usually triggered when dogs face strangers or unfamiliar situations. Suddenly waking up a sleeping dog or making a loud noise are a few examples of encouraging fear aggression. Though early socialization may help your dog cope with unfamiliar situations, there is no ‘cure’ for fear aggression. Even after months of training and socializing, your dog may still react violently and unpredictably in a fearful situation. However, all is not lost. You can take a few precautions that will help manage the problem and stop your pooch from overreacting in such conditions. The first thing you need to teach your children is not to approach fear-biting-dogs (dogs showing fear aggression) unexpectedly or make a loud noise when they are around. Consult a qualified dog trainer to build your pooch’s confidence. Try to make your surroundings as predictable as possible until your furry friend is confident enough to deal with strangers and unexpected situations. 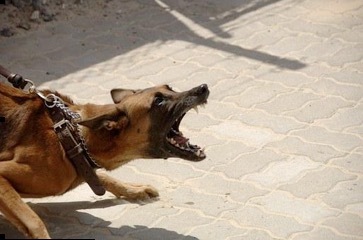 Frustration can also contribute to aggression in dogs. Just like their two-legged friends, dogs also feel frustrated and angry when they feel trapped or are being coerced into doing something they dislike. Other reasons may include not having sufficient control over one’s environment, the lack of personal space, insufficient physical and mental exercise, and miscommunication. As a pet owner, you have to learn to deal with this behavior. Other than providing your pooch with enough physical and mental exercise, you also need to teach him/her to deal with feelings of disappointment and frustration. This post offers detailed guidance on teaching your dogs to remain calm even when they can’t have something they want. Man’s best friend can sometimes turn into his worst enemy, particularly when provoked. Sometimes, when we fail to respect their limits, dogs can lash out, inflicting serious injuries on their human friends. Even seemingly harmless behavior such as a hug or a pat on the back can lead to a bite. A keen observation of dogs’ behavior and a thorough understanding of common dog bite causes can help you manage their aggressive behavior. Combining this with proper dog handling lessons can reduce the chances of a bite among children as well as adults.